This publisher’s note corrects errors in the funding and references of Adv. Opt. Photon. 10, 703 (2018) [CrossRef] . 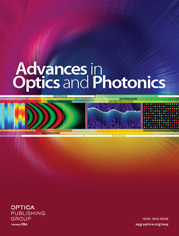 D. Xu, X. Xiong, L. Wu, X.-F. Ren, C. E. Png, G.-C. Guo, Q. Gong, and Y.-F. Xiao, “Quantum plasmonics: new opportunity in fundamental and applied photonics,” Adv. Opt. Photon. 10, 703–756 (2018).